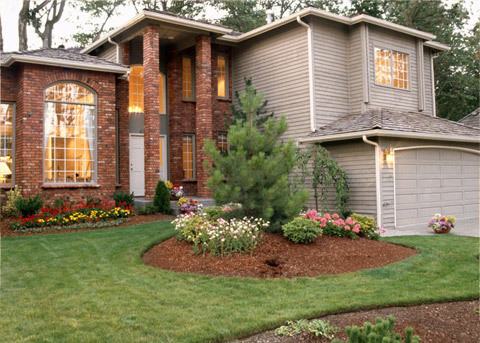 Fertilizing- It is extremely important to provide your lawn nutrition in the correct amounts and correct time frames in order to have success of a lush, attractive lawn. Providing too much nutrients at one setting attracts insects and diseases, providing too little nutrients isn’t beneficial in standing up to everyday stress. How often should I fertilize my lawn? Four Seasons Lawn Care recommends feeding your lawn every 6-8 weeks. Isn’t it useless to fertilize my lawn in the winter? Of course not, your lawn is only dormant in the cool seasons not dead, fertilization is still needed in the winter to maintain a nice lawn and ensure a green lawn in early spring. If I wanted to fertilize my own lawn how do I find the area of my lawn? You would need to measure the Length of your lawn and multiply it by the Width, this total will give you the sq. ft. needed to properly fertilize your lawn. What are those 3 numbers on the fertilizer bag? Good question, the first number represents the Nitrogen which gives lawn the green color, the second number is the Phosphorus which helps the roots to grow, the third number is the Potassium which strengthens the lawn. Does fertilizing my lawn mean more mowing? Not necessarily, the key is to use a quality fertilizer with “time--released nitrogen” which periodically feeds your lawn. Is it best to use liquid or bag fertilizer? They are both beneficial to your lawn, the difference is the liquid form is always a quick release and doesn’t last as long unlike quality bag fertilizers. Can I use any type fertilizer on any grass type? No. It is imperative to know what type grass you have before you start putting “any” chemicals on your lawn, which could lead to serious damage to your lawn. How do I find what grass type I have? Listed below are the six commonly grass-types found in Georgia. Watering- Keeping your lawn well-hydrated is a necessity in order to see the benefits of a beautiful lawn. Remember, fertilization and proper watering goes hand & hand. How long should I water my grass? In order to know this you must know how much water your sprinkler is putting out at a given time. To do this use an empty can(canned good), mark the can at the ½ inch mark and run your sprinkler until it reaches this mark(keep track of time). Use the time it took to reach ½ inch mark and water for that amount of time at least twice a week. Should I depend on rain to water my lawn? In most cases I would say no, unless you are getting excessive amounts of rain(which is rare in Georgia) within a given week. A rain gauge is a good tool to measure rainfall to be sure you are getting adequate amounts. What is a sure sign that my lawn isn’t getting enough water? If you walk on your lawn and look back and see visible footprints, this is a sure sign that your lawn is in need of immediate hydration. I’ve followed all your suggestions on watering and my lawn is still not as green as it should be, what’s wrong? Most times this means the water is not getting to the root zone which is either caused by compact soil or thatch(excessive amounts of dead grass). When is the best time of day to water my lawn? 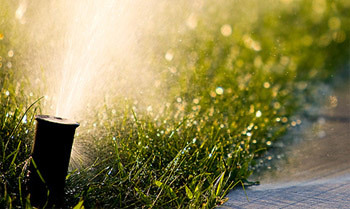 Four Seasons Lawn Care recommends watering early mornings in between 6-8am. Winds are usually low at this point of the day and the sun is just rising. Watering at night attracts diseases and insects to your lawn. Watering at midday when the sun is fully exposed will cause your lawn to burn at the tips. Troubleshooting- This section can range from controlling thatch, aerating your lawn, choosing sod or seed to repair bare spots, etc. What exactly is “thatch”? 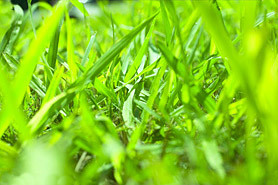 Thatch is a layer of dead grass that prevents water from reaching the roots of your lawn. How do I avoid thatch build-up? The key to avoiding thatch is to water, fertilize and especially mow your lawn correctly. How do I get rid of thatch? The use of a de-thatching tool is required to properly remove thatch or aerating the entire lawn is an option. When is the best time to de-thatch my lawn? In the south (Georgia) the best time to do this is late spring. 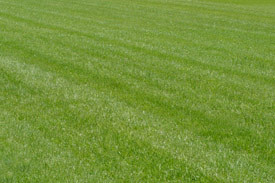 Allow 2-4 weeks for lawn to recover. What is aerating? Aerating is a the process of pulling plugs of soil from lawn creating air channels in the ground to reach the root zone. When is the best time to aerate? Its best to aerate during the peak growing period. What’s better, seeding or sodding? Well that depends, if you are on a budget seeding is the way to go, but for a quality, professional look sodding is the route to take. How do I repair bare spots in my lawn? The first step is to use the same grass type that is surrounding the bare spot, once you have installed new seed or sod you must water daily and avoid mowing until area is established.